The Korean Government plans to create a triple-helix innovation cluster in western Seoul in 2020, by connecting the Yeouido financial companies, with the districts universities – Yonsei University and Sogang University and the Mapo complex. The Mapo complex – all called the “Mapo Innovation Town”- is a huge start-up hub whom creation was announced by the Finance Ministry, Financial Services Commission (FSC) and the Seoul Metropolitan Government, in August 2018. The decision was made upon the following statements. According to the Ministry of SMEs and Startups, in the first half of 2018, the number of new companies increased 6.8 percent from a year ago to hit 52,790, an all-time record. Meanwhile, there is a shortage of affordable spaces for young companies. 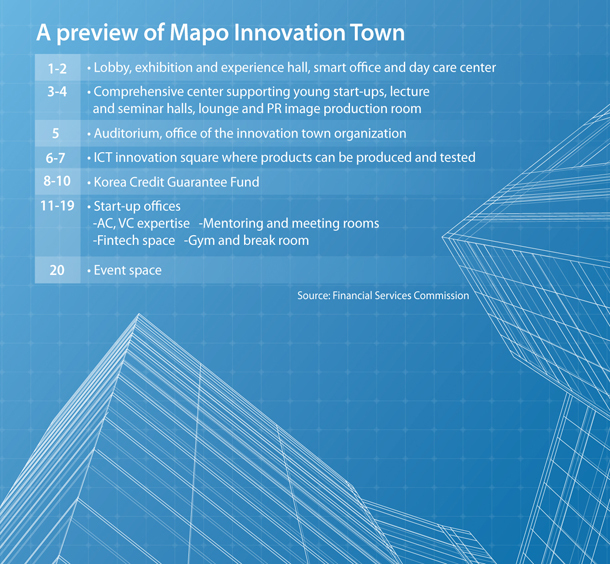 The Mapo Innovation town is a 20-stories building dedicated to the incubation and acceleration of 300 start-ups. The building will open in 2020. “The centre will support start-ups from young people using fourth industrial revolution core technologies, such as fintech, artificial intelligence and blockchain,” said Sohn Joo-hyung, an official at the financial industry bureau of the FSC, quoted in the Korean Joong Daily. With the creation of the “Mapo Innovation Town” and the creation of the innovation cluster, the Korean Government, wants to uplift the whole western Seoul innovation ecosystem by integrating with IT clusters on Gangnam’s Teheran-ro and in Gyeonggi’s Pangyo Technology Valley.